Editor’s note: On Feb. 22 the Rhode Island Department of Transportation withdrew its major amendment that requested nearly $28 million be redirected from alternative transportation projects to pay for street paving and bridge repair work. The state agency noted that an unexpected influx of nearly $70 million in federal money allocated to Rhode Island though the Transportation, Housing and Urban Development, and Related Agencies Appropriations Act of 2019. The Transportation Advisory Committee public hearings on the RIDOT amendment scheduled for Feb. 25 and 28 have been canceled. PROVIDENCE — Drew Pflaumer’s commute to work, from Broadway to One Capitol Hill, typically on his own two feet, was, for a planner, depressing. The city’s car-centric design didn’t make for a pleasant walk and once he got to work he knew any attempts to make Rhode Island more bicycle and pedestrian friendly would face tremendous resistance. After 16 months as a principal planner for the Division of Statewide Planning, the 29-year-old Indiana native left in mid-January for another challenge. Pflaumer left the state’s employ before the Rhode Island Department of Transportation (RIDOT) requested money designated for alternative transportation projects be used to make up for shortfalls in pavement and bridge funding. He recently told ecoRI News he’s not surprised the needs of pedestrians and bicyclists are being overlooked, the will of voters disregarded, and guidelines and laws ignored, such as the State Guide Plan and Rhode Island’s complete streets statute. “The state is resistant to progress,” said Pflaumer, who has also worked as a municipal planner and as a transit planner. “There’s no critical mass of people who care.” He was referring to those who hold power. 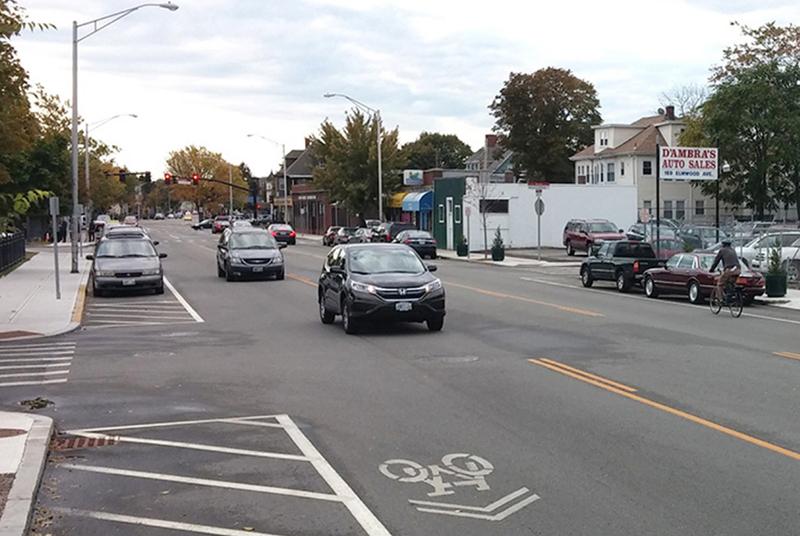 Late last month RIDOT requested a major amendment to the 10-year state Transportation Improvement Program (TIP) that included a substantial funding cut, about 33 percent, to bicycle and pedestrian projects in the Transportation Alternatives Program (TAP). The Transportation Advisory Committee (TAC) will hold two public hearings this month to accept comments on the 200-plus-page amendment. The current state transportation improvement program also includes a number of administrative adjustments and one minor amendment. The proposed amendment delays, reduces, and eliminates nearly $28 million in funding to some three dozen alternative transportation projects statewide. RIDOT’s request proposes to “significantly redistribute funding to projects to cover increased construction costs, funding reductions, and align the program with Bridge and Pavement asset management priorities,” according to the Division of Statewide Planning. This shuffling of earmarked resources Pflaumer said is part of the “shell game Rhode Island loves to play.” He noted that with few exceptions at the state level — he specifically mentioned RIDOT’s Office of Transit as one such example — “nobody cares at all” about alternative modes of transportation. “It’s sort of appalling,” said Pflaumer, who worked in the planning departments at the Rhode Island Public Transit Authority and for the town of Middletown before his time at the Division of Statewide Planning. During his time working for the state, Pflaumer, who noted that he spent considerable time at the Division of Statewide Planning signing off on work done by consultants, said the only guiding principle he routinely observed was the effort to “rebuild all things as is as quickly as possible.” He pointed to the 6-10 Connector project as a great example. He noted that RhodeMap RI plan, which included increasing transportation options, protecting open space, increasing affordable and energy-efficient housing, expanding education and job opportunities, and better planning for future growth, was essentially scrapped by state officials for being too progressive. He said when municipal officials are caught off-guard by a RIDOT repaving or reconstruction project and request changes that better fit with their city or town’s comprehensive plan, the state agency becomes a bully. He noted that a final vote on what would be Rhode Island’s first statewide initiative to strategically expand the state’s bike path network keeps being delayed, because it includes ideas that push the state’s guiding principle: rebuild all things as is as quickly as possible. The State Planning Council is the entity responsible for approving the plan, but the Division of Statewide Planning needs to put it on a meeting agenda for the 27-member council to formally view the plan. The 113-page draft document — part of the Rhode Island Moving Forward 2040 plan — lists eight goals: connect and expand the state’s bicycling network; integrate bicycling with transit and other modes of transportation; develop stronger statewide bicycling policies; promote equity in bicycle planning and funding; increase bicycle safety with policies and programs; leverage bicycling to promote economic development; improve public health through bicycling; and promote bicycle transportation for Rhode Island employees. The largest single portion of RIDOT’s TAP cut is a $14.9 million reduction in the program’s general contingency account, “which reflects the improved scoping and scheduling methodologies being adopted,” according to the agency’s major amendment. The state’s TIP for fiscal years 2018-2027, though, highlights the importance of setting aside money to fund pedestrian and bicycle facilities, recreational trails, safe routes to school projects, and environmental mitigation related to stormwater and habitat connectivity. At less than 3 percent of the state’s transportation budget before the recently proposed cuts, advocacy groups note that the TAP budget is already underfunded. The money RIDOT wants to scoop out would be used for, among other things, road paving, the 6-10 Connector project, and bridge work. The state typically spends between $400 million and $500 million annually on transportation projects. Most of that money is used to fund street paving and bridge repair. Rhode Island’s 39 municipalities combined spend millions more annually on road paving. The Rhode Island Bicycle Coalition is among the critics of RIDOT’s proposed delays and cuts. The organization noted that RIDOT has proposed slashing funding for bicycle projects despite 78 percent voter approval for the 2018 Green Economy Bond, which included $5 million for state bikeway development. A 2016 Green Economy Bond received 67 percent voter approval and included $10 million to expand the state’s bikeway network. The Rhode Island Bicycle Coalition has noted that the state needs proper bicycling infrastructure, such as separated lanes. Green Economy Bond voters weren’t asked to approve more sprayed-painted road bicycles. Coalition board member Christian Roselund said the state in recent history hasn’t been a leader in spending on bicycle infrastructure projects, or on alternative transportation in general. He noted that some of the biggest gaps in Rhode Island’s bike path network are created by state-owned roads and bridges. “We’ve seen outright hostility toward bicycle and pedestrian infrastructure from RIDOT for years,” he said. Another Rhode Island Bicycle Coalition board member, Kathleen Gannon, said the state doesn’t adequately support multimodal transportation efforts that include buses, walking, bicycles, electric bicycles, and scooters. This ongoing neglect and the recent amendment proposal, she said, has and will have an impact on safety, undermines what people want, and effects the economic development of cities and towns. Alternative transportation projects proposed to be delayed, cut, or canceled by the RIDOT request include the William C. O’Neill (South County) Bike Path extension in South Kingstown, the Woonasquatucket Greenway extension, City Walk and on-road connections in Providence, the Ten Mile River Greenway extension in East Providence, the Trestle Trail in Coventry to connect to paths in Connecticut, the Blackstone Bikeway in Woonsocket, and the Warren Bike Path. Freeman, who is also a member of the Paths to Progress coalition that advises the state on bicycle and pedestrian project planning and funding, noted that on Aquidneck Island, RIDOT’s request eliminates funding for the Melville Connector and the Mount Hope Bay Path in Portsmouth and the shared use path and sidewalks on East Main Road in Portsmouth and Middletown, and delays the scheduled improvements to Thames Street, Spring Street, Farewell Street, Bellevue Avenue, and Marlborough Street in Newport to 2023 and beyond. Portsmouth Town Council member Daniela Abbott is among those opposed to the proposed funding cuts to bicycle and pedestrian projects. The Portsmouth Town Council is expected to vote on a resolution rejecting the major amendment. Despite concerns about the proposed cuts and delays to alternative transportation projects, Freeman is confident a solution can be reached. She said it only makes sense, for example, that if the state still plans to pave East Main Road that it would incorporate the bicycle and pedestrian aspects of the project while that road work is being done. We weren’t granted an interview. The agency’s four-paragraph crafted statement claimed no bicycle projects have been eliminated. RIDOT’s canned response also noted that there is $4.7 million allocated for bicycle and pedestrian projects this year and a total of nearly $60 million worth of bike projects in the 10-year plan. Two other projects in the amendment request — “East Main Road Sidewalks” and the “Woonsocket River Landing” — would also be eliminated because of a lack of funding. He also noted that several pedestrian projects are on the chopping block and that numerous other projects have been pushed back outside the portion of the TIP required to be fiscally constrained. Left unsaid is the fact that Rhode Island’s bridges and roads in disrepair got that way because RIDOT higher-ups failed to do their jobs and the Statehouse preferred to focus on other things, such as trying to eliminate the car tax, than making sure infrastructure improvements were adequately funded. This same lack of leadership four years ago led to the Environmental Protection Agency taking RIDOT to court for illegally discharging polluted runoff into local waters. The feds stepped in because the state failed to adequately enforce the Clean Water Act and the terms and conditions of RIDOT’s national pollutant discharge elimination system permit. Opponents of the proposed amendment claim municipal officials and alternative transportation advocates weren’t consulted before the proposal to cut or delay projects was announced. They say RIDOT seems to have made arbitrary decisions about the suitability of projects that had been carefully developed over years, some even decades. Other local advocacy groups are also frustrated. The final decision on the proposed amendment falls to the State Planning Council. The council is housed within the Department of Administration and most of the board’s membership is appointed by the governor. Its 27 members include Michael DiBiase, director of the Department of Administration; Rosemary Powers, the governor’s deputy chief of staff; Meredith Brady, associate director for the Division of Statewide Planning; Peter Alviti, RIDOT’s director; and Janet Coit, Department of Environmental Management director. The State Planning Council, is by law, supposed to be an independent agency. It’s Rhode Island’s only Metropolitan Planning Organization (MPO), which are created and designated to carry out a metro area’s transportation planning. However, since Rhode Island’s only MPO has more than 50 percent of its seats controlled by the governor, true independent decision-making isn’t realistic. It becomes just another political tool. MPOs are reviewed periodically by committees led by the U.S. Department of Transportation to make sure they operate as federal law requires. The State Planning Council had its review last year, and several problems were found, including the fact the governor controls a majority of the votes. * The story was updated Feb. 20 to note that Green Economy Bond money approved by voters in 2018 isn’t being directly taken to fund bridge repair work. Editor’s note: Bari Freeman is a member of the ecoRI News board of directors.